Fortify your Dividends with our great Specials! BEST OFFERS, happen only once a YEAR!!! package is good for 12 months. Get Ready for Holiday season with LED Photorejuvenation or Miccrocurrent Face-Lift. 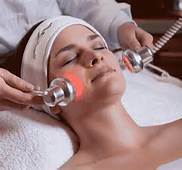 This non-invasive procedure causes no inflammation and requires no special post treatment procedures and proven to be effective for cosmetic purposes diminishing the visible appearance of fine lines, wrinkles, and acne, aging spots, sun damage. 6 weekly sessions will give your skin new, youthful look you dream about. Add to this treatment any of our European Facials for half price.